“Interior Design is equal parts art and science,” writes Dr. Ellen Fisher, NYSID’s Vice President for Academic Affairs and Dean, in the introduction to her book, New York School of Interior Design: HOME: The Foundations of Enduring Spaces. “It is problem solving with an added value: the designer’s unique creative twist and ability to refine solutions with an eye for beauty and empathy.” The book, published by Clarkson Potter in March 2018, with photographs by Mark La Rosa, is a vast reservoir of knowledge that draws on NYSID’s Basic Interior Design curriculum. The format is fun, and easy to apply for DIYers tackling residential projects on their own. Says Alexa Hampton in the foreword, “This book is an essential text for all students of design. . .[as well as] inspiration and intel for those interested in the art and practice of the discipline.” With this publication, Dean Fisher follows in the footsteps of NYSID founder Sherrill Whiton, whose book, The Elements of Interior Design (1937), helped shape the field as a widely used interior design textbook. The IFDA (International Furnishings and Design Association) Awarded its Elizabeth Brown Grant to NYSID for the purchase of advanced virtual reality headsets and the introduction of “VR” to its curriculum. Says Dr. Ellen Fisher, NYSID’s Vice President for Academic Affairs and Dean, “Virtual reality allows designers to preview what they have designed in three dimensions and to give clients an idea of an imagined space.” NYSID will pilot a course in virtual reality, overseen by Assistant Dean Richard Todd Class, in the BFA program this spring. In 2015, a team of MFA-1 students in the Experiential & Service Learning course, then taught by NYSID faculty member Francisco De Leon, proposed a redesign of Brownsville, Brooklyn’s 73rd Street Police Station vestibule through an initiative with the NYC Department of Design and Construction and the department’s Town + Gown program. The student-designers on the project, Daniella Brecher, Anna Enya Dzubey, Orianna Ellison, and Hsien-Huei Wu, interviewed police officers and community members to research their design. They will finally see their guidelines for a more welcoming vestibule implemented. The Daily News reports that the city has set aside one million dollars to improve the 73rd and three other Brooklyn precincts. As part of the summer Experiential & Service Learning course taught by NYSID faculty member Terry Kleinberg, eleven students worked with the nonprofit victim services agency Safe Horizon to redesign the interior of a shelter for survivors of domestic violence and their children. MFA-1 students Mika Jiaravanont, Rebecca Kim, Alexandra Nino, Joanne Park, Sarah Salerno, Siyu Miao, Xiao Tang, Allie Weber, Divya Rai Gupta, Nanmei Jiang, and Diana Soriano self-selected into teams working on plans for four types of rooms: the daycare center, the lounge, counseling, administrative, and intake offices, and a typical residential unit. The students interviewed social workers and staff to identify the problems they needed to solve. Since each residence within the shelter is shared by two families, it was important to visually demarcate the ownership of space, so the design team working on the residence came up with a sensitive color-coded system. “It is incredible to see what a powerful experience it can be for students to do this kind of work,” says Kleinberg. “Having real clients with real parameters makes problem-solving more challenging but also easier because it provides a context for making decisions.” Faculty member Eric Cohen helped mentor the group, and MPS Lighting students Chonlatorn Pornpraphan, Diogo Coelho, and Nehal Agarwal volunteered expertise because lighting is a critical component of trauma-informed design. The interior designer Harry Heismann spent nine years honing his skills in the offices of the late Albert Hadley, the legendary designer and influential member of NYSID’s board of advisors, who dubbed his protégés’ desk “the magic desk.” Now Heissmann shares this magic with NYSID students in the form of a quartet of courses called “Advanced Trade Techniques,” which teach students high-level designing in Custom Upholstery (I), Custom Flooring (II), Custom Wall Treatments (III), and Custom Cabinetry (IV). These “mini-courses” are one-credit electives in the undergraduate program. Non-matriculated students may take up to twelve credits before entering a program, so anyone interested in the craftsmanship behind bespoke design can take all four. Eileen Judell’s all-Albert-Hadley-designed apartment exists as if preserved in amber, and she was kind enough to welcome a large group of alumni into her home on June 13 for a guided tour of this residence, a functioning piece of design history. On September 13, alumna and faculty member Valerie Mead led a group of alumni through the NYC headquarters of the Garden Club of America. NYSID alumna Sana Kahn ’18 (MFA-2) won the 2018 International Interior Design Association Student Booth Design Competition at Orgatec and, as a result, was flown to Cologne, Germany, to execute her design. Ms. Kahn created her contest submission in an exhibition design studio taught by NYSID faculty member Ian Gordon, Principal of e+i Studio. Ms. Kahn’s design, the “IIDA Cloud,” was a formation of cubes that evokes a cloud and is meant to represent the circulation of design ideas around the world. Chonlatorn (Tan) Pornpraphan ’18 (MPS-L) was one of three students from the Tri-State Area who won The New York City Section of the Illuminating Engineering Society’s Annual Thesis Prize. A team of NYSID MFA-1 students mentored by Barbara Lowenthal, NYSID’s Associate Dean for Graduate Studies, won the International Interior Design Association’s 2017 Student Design Competition, sponsored by OFS Brands. Nanmei Jiang, Ara Kim, and Wan Ting Hsieh won first place and $2,500 for their project, called Homffice. In 2018, the Associate in Applied Science (AAS) degree became available online. The AAS is self- paced and offers a new and exciting opportunity for students to enter the profession on a schedule that works for their lives. In 2015, NYSID started a contest that challenged its students to create a design for a room at Holiday House, an annual showhouse that benefits breast cancer organizations. The very first winner of the Holiday House Competition was Cheryl Sadlowski. This year she, and many other former Holiday House competitors who have since graduated and entered the field, participated again, this time as alumni mentors. Krista Gurevich mentored Tori Thorgersen (BFA); Cheryl Sadlowski mentored Mackenzie Williams(MFA-1); Elise Morrissey mentored Miao Siyu (MFA-2); Michelle Lau mentored Yelim Lyndsey Noh (BFA); Topaz Wong mentored Pei Jung Hsin (MFA-2), and Rose Darline mentored Ahuja Shivya (MFA-2). The winner will be revealed on November 27, 2018, and earn the prize of having their room installed in the 2019 Holiday House. Michelle Lau, who graduated from the MFA-1 in 2018, was the winner of the Holiday House competition last year, and her design will be featured in this year’s 2018 Holiday House. Excellence in design education was the focus of the President’s Dinner at the 2018 Kips Bay Decorator Show House. NYSID was among five NYC art and design schools honored for educating generations of our nation’s creative designers. 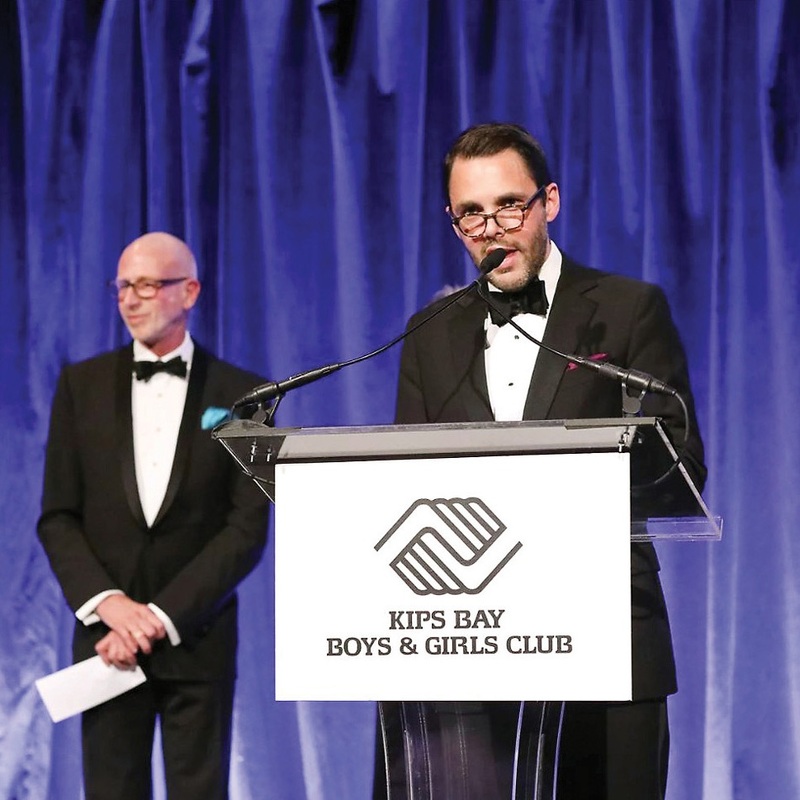 The event kicked off the 2018 Kips Bay Decorator Show House, this year chaired by Bunny Williams, an event that’s a bellwether for interior design trends and a fundraiser that raises thousands for afterschool programs in the city via the Kips Bay Boys & Girls Club. 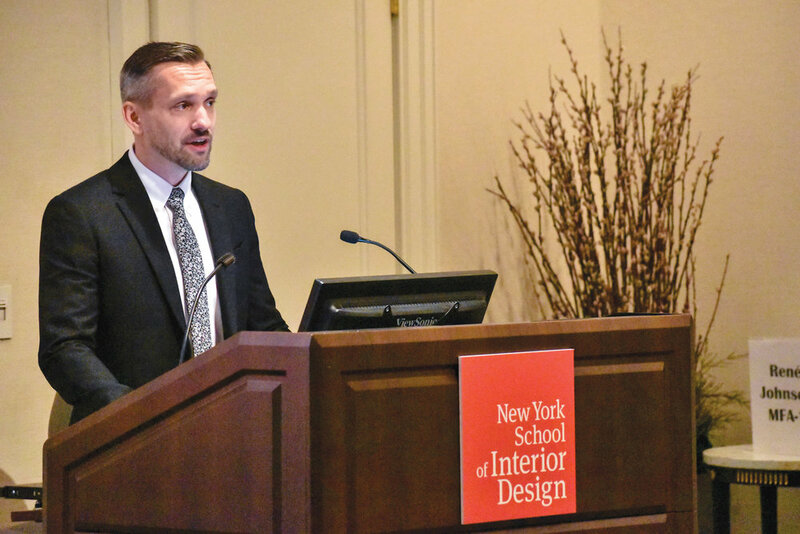 Several members of the NYSID community designed rooms in the show house, including trustee Alexa Hampton, faculty member and alumnus Stefan Steil, and alumnus Charles Pavarini III. Three exhibitions in 2018 were opportunities for students and members of the public to immerse themselves in important facets of interior design. NYSID faculty member Zhijian Qian, one of the world’s foremost experts in contemporary Chinese art, curated “Blurred Boundaries: Recent Works by Chinese Artists in New York,” an exhibition that ran from February 12 to March 2, and was produced in conjunction with Beijing’s Central Academy of Fine Arts. “Pieter Estersohn: A Practiced Eye” ran from March 22 to May 11 and explored the career of one of the premier architectural photographers of our time. From September 13 to November 10, “1:1 Drawing, Design and Communication,” curated by Darling Green in consultation with NYSID faculty member Judith Gura, explored the drawings of designers who have made the innovative communication of form central to their practice. From May 27 to June 9, a group of undergraduate and graduate students led by NYSID’s Associate Dean Barbara Lowenthal had the opportunity to experience Viennese architecture and interiors firsthand, from the Baroque glories of the Hapsburg Empire, to Otto Wagner’s seminal Postal Savings Bank, to the daring design of Jean Nouvel. Ms. Lowenthal forged relationships with local designers and architects, creating access to private tours through Zaha Hadid’s stunning Vienna University of Economics and Business Library and Learning Center and Stephen Holl’s Loisium Spa Hotel and Wine Center. The group also took intimate tours of contemporary workplace, retail, and hospitality interiors introduced by the interior designers themselves. A high point of the trip was a visit to the iconic Villa Tugendhat in the Czech Republic, designed by Ludwig Mies van der Rohe. Sixteen alumni took time from their hectic schedules to mentor a student designer in the 2017–18 school year. The professional relationships that develop between NYSID mentors and mentees take many shapes and often extend years beyond the student’s graduation. This past year, Court Whisman ’05 (AAS), of Eve Robinson Associates, Inc. mentored MacKenzie Williams (MFA-1). Joshua-David Lefowitz ’11 (AAS), of Joshua David Design, mentored Karen Dan (AAS). Arlene Angard ’08 (AAS), the principal of her own firm, mentored Cielo Cortes (AAS). Lisa Casertano ’02 (MFA-2), of Cierno Designs, LLC, mentored Michelle Simms (MFA-1). Carissa Byrne ’09 (BFA) of STUDIOs Arch mentored Emily Yu (MFA-1). Brooke Lichtenstein ’09 (BFA) and Yiannos Vrousgos ’09 (BFA), of Input Creative Studio, mentored Paul Lee (BFA). Valerie Genovese ’16 (BFA), of Bentel & Bentel, mentored Rebecca Kim (MFA-1). Billy Cegila ’99 (BFA), of HOME, mentored Inga Vincent (MFA-1); Lauren Stern ’07 (AAS), of Lauren Stern Design, mentored Vanessa Skawski (AAS); Lawrence Chabra ’09 (BFA) of RAMSA, mentored Mimi Chen (MFA-1); Andrea Brodfuehrer ’14 (AAS), of “von b” interiors, mentored Ioanna Kyriazi (MFA-1). Mike Bowers ’16 (MFA-2) mentored Gabriele Sarzynski (MFA-1). Shannon Andrews ’11 (MFA-1), of Gensler, mentored Sarah Stevens (MFA-1); Joe-Hynn Yang’16 (MFA-1) mentored Yi-En Lee. Elise Morrissey ’01 (AAS) mentored Leanna Sjursen (BFA). NYSID is grateful to these mentors, who provide invaluable insight to our students and have a huge impact on their careers. To volunteer to be a mentor, reach out to Samantha Fingleton at sfingleton@nysid.edu.